NoMIX is a single-component, moisture-activated temporary cement ideal for short-term applications. 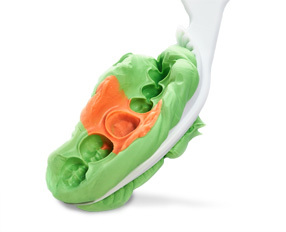 It is fully compatible with acrylic, composite, PFM and ceramic materials. NoMIX requires no mixing whatsoever. 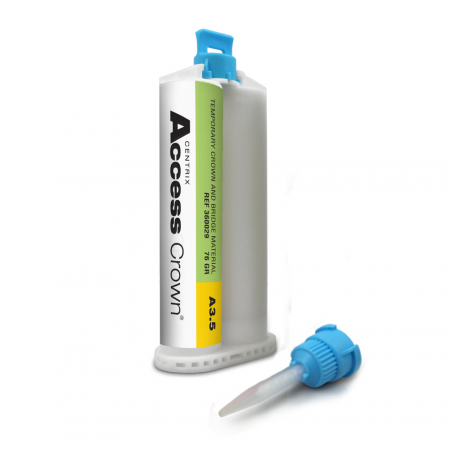 Simply apply to the inside of the provisional and affix to a moist tooth surface. 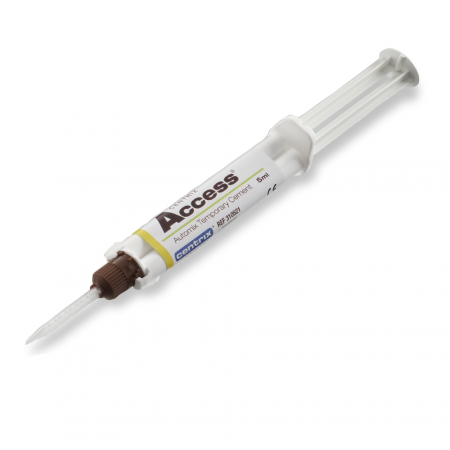 NoMIX expands slightly upon setting for a tight seal, and is easy to clean off prior to permanent cementation. NoMIX take-home applicators eliminate those late-night “emergency” calls or unscheduled office visits that disrupt the day. If a temp dislodges, patients can use professional-strength NoMIX and reseat the unit. NoMIX® has a unique dual setting reaction. First, the resin part sets rapidly on contact with water. Then second, the calcium sulphate sets after a few minutes to give the final hardness. Once exposed to water, the material begins to set. Wait 5 minutes to remove excess. Material will fully set in 15 minutes to an hour. How do you clean off NoMIX? NoMIX can be removed easily. In office: rub off with cotton roll; remove with scaler. By patient: brush with toothbrush. Does NoMIX have eugenol in it? No, there is no eugenol in NoMIX to inhibit resins from setting. Can I replace Duralon with NoMIX? No. Duralon is a permanent cement made by 3M ESPE. Some doctors add a lubricant to Duralon to lower Duralon's mechanical adhesion and make it "less permanent." NoMIX would not be an appropriate substitute for Duralon. BUT NoMIX Take Home Units are a great solution for a patient should his permanent crown fall out. What to do about sensitivity in a vital tooth? If a patient is experiencing sensitivity to vital tooth when NoMIX applied, make sure the prep is wet. The material is drawing moisture from the dentin tubules and that is causing the patient sensitivity. Some patients are extra-sensitive, so an application of a dentin desensitizer like Glu/Sense or D/Sense Crystal would be in order to occlude the tubules PRIOR to cementation. Leave prepared tooth moist. Do not dry. Lightly coat the internal surfaces and margins of the dry restoration with NoMIX® Temporary Cement. Place and check for fit. Have patient bite down. Wait 5 minutes. Cement will be set enough to gently remove any excess cement. Rinse out well with water. If necessary, clean the interproximals by knotting a piece of floss and pulling through (not up). The cement will fully set in approximately 15 minutes. It is recommended to instruct patients to not eat for at least 1 hour.